Welcome Families Smarter Balanced What You Can Do at Home Get Involved! 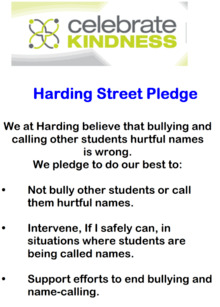 Harding Street School, a community of students, parents and staff, will work collaboratively to develop the academic, social, moral, ethical, and leadership values which students will need to become successful contributing members of society in an ever-changing and technological world. Harding Street School, a community of students, parents and staff, provides a strong educational foundation, and is a safe environment that engages all students intellectually and socially in becoming responsible, contributing citizens in a diverse society who are college and career ready. "Where all children learn to be College Prepared and Career Ready!" Congratulations to our Harding Students who participated in the 2019 LA's BEST Regional Science and Engineering Fair on March 7, 2019. Harding's Team included students: Delayla Montero, Aurora Diaz, Jean-Pierre Alejandre and Holly Espinoza along with their Leader Alexander Oda. Our team also took a picture with Assemblywoman Luz Rivas! Great Job! 8:30 a.m. – Coffee with the Principal – Parent Center / Cafecito con la Directora – Centro de Padres. 3-5 grade students to do their best on the SBAC test!! hagan lo mejor en el examen SBAC!!! DJ for our Father Daughter Dance! DJ para nuestro baile de padre e hija! 5:30 – 8:00 p.m., por favor contacte la oficina. ¡Gracias de antemano por su cooperación! Please help us remind our students that we need to take care and respect our school property. We want students to respect their school just like they respect their homes. Thank you in advance for your support. Por favor ayudenos a recordarles a nuestros estudiantes que necesitamos cuidar y respetar la propiedad de nuestra escuela. Queremos que los estudiantes respeten la escuela así como respetan sus casas. Gracias en anticipación por su apoyo. Above are students that were part of our Bully Committee that helped organize our “No Name Calling” week. They were also part of the unveiling of our new Buddy Benches! These benches will be a special place in our school playground where a child can go when they want someone to talk to or would like someone to play with. We all want to do our best to help others and always do our best to be kind. Our before-school and after-school programs encourage families to play an active role in the quality experiences that the Y provides for your children.